It’s almost Black Friday 2018, which will start the largest shopping season of the year. And, the average person will spend around $900 on gifts this holiday season. In fact, according to a survey done by MagnifyMoney, American consumers took on an average $1,000 worth of debt in 2017 holiday spending, and that number has grown in the past few years. Putting your holiday spending on a credit card is a major problem because of the interest and finance charges you will rack up if you can’t pay your credit card off when the bill comes. That will hurt your credit score, your credit history, your debt to income ratio, and more. The holidays mean different things for different people, but for most everyone, it’s about celebrating with the people you love and care about– not debt. Going into debt for gifts and holiday events just adds stress and it takes away from the true meaning of the holiday season. I know that the start of the holiday spending season can be really exciting, but let’s make Black Friday 2018 the start of a new tradition, one that doesn’t include going into debt! Here are my tips for saving money this holiday season. Create a budget before Black Friday 2018. Before you make a list of all the things you want to buy for the holidays, you should set a realistic holiday budget. This will help you stay on top of your spending so that you won’t go into any holiday debt. I recommend seeing how much money you already have set aside for the holidays, analyze how much you think you will spend, and figure out what you need to do so that you don’t go over your spending budget. To get started, make a list of who you’ll be buying for, the events you’ll be attending, any travel you’ll be doing, and go from there. It helps to think about all of the things you spent money on in previous years. You might be shocked by your spending! Use a cash budget for holiday spending. A cash budget is when you set aside a certain amount of cash for all of your holiday spending. A cash budget works because you can easily see how much money you have to spend and because it will help you separate your “wants” from your “needs.” To make a cash budget work, you will have to carefully plan out each purchase and it helps if you don’t bring all of your cash with you at once. This will prevent impulse purchases and keep you from overspending on Black Friday deals. Now, there may be some things that you can’t purchase with cash, like some travel expenses, so make sure you are prepared for those as well. The holidays don’t just have to be about buying gifts for everyone. And, if you’re running low on time or money, then you may want to start cutting back on the number of gifts you give this holidays season. I know many people who give numerous gifts around the holidays, and while they may be able to afford it, that isn’t all that the holidays are about. Keep your budget in mind and only buy what you can afford, even if that means you can only give one present. It’s the thought that counts, not the gift or the amount of gifts that you give! Actually, more and more people are rethinking their holiday spending and taking more of a minimalist approach by giving fewer gifts and focusing on meaningful interactions with those they care about. Don’t fall for all of those Black Friday deals. Both online and in-person stores uses sales to draw shoppers in, and these aren’t just Black Friday deals, they do it year around. But, many of the deals you find during big sales aren’t actually deals at all. My least favorite holiday sales tactic is when stores mark items up just before they are marked down to make the sale price look like a good deal. Make sure you do your research on what you’ll be buying so that you can always purchase the best products at the best prices. Receive cash back on your Black Friday 2018 shopping. Sign up for a website like Ebates where you can earn CASH BACK for spending how you normally would online. The service is free too! Plus, when you sign up through my link, you will receive an extra $10 cash back! I love using Ebates for online shopping because it’s so easy to earn money, and you can even use Ebates on Black Friday deals, but remember to be careful! Look for ways to cut back right now. In order to stay out of debt this holiday season, you may want to start looking at ways to cut back on your regular spending. 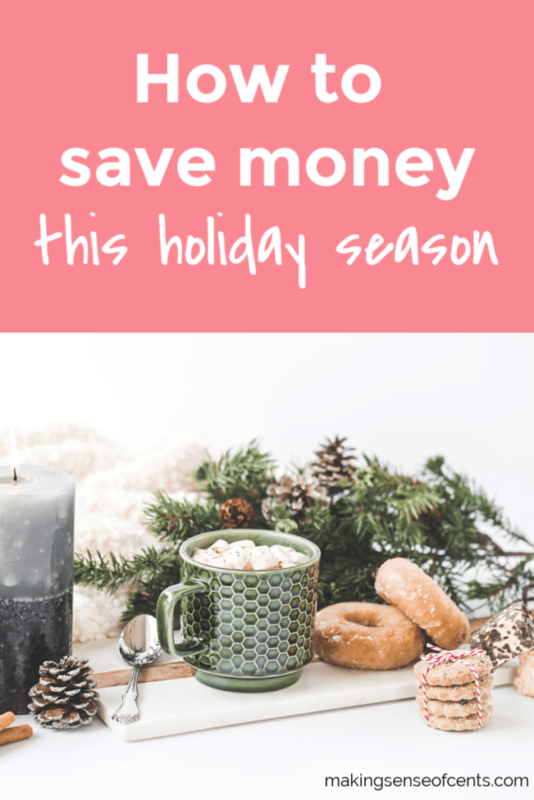 We all have lots of things we can probably cut from our budgets, and they can help you save money beyond this holiday season. Even if you can only find an extra $100 to spend, that’s still $100 more than what you had before. Get rid of your cable. Find a more affordable cell phone plan. Cut out some subscription services. Stay out of the salon and cut your own hair. You can read even more ways to save money at 30+ Ways To Save Money Each Month. Learn how to make additional holiday spending cash. If you can’t find ways to cut back, then you may want to find ways to make more money. This can make the holiday season a little more enjoyable as you won’t have to go into debt or use your savings in order to purchase holiday gifts. Plus, there are tons of things you could do to make extra money, starting with a part-time holiday job. Many companies hire extra help for the holidays, like UPS, Kohls, Macy’s, Christmas tree lots, restaurants, and more. Dog walking or pet sitting through a company like Rover. Learn more at Rover – A Great Way to Make Money And Play With Animals. Shovel snow around your neighborhood. Become an Uber or Lyft driver. Here’s how you can start driving for Uber today. Learn more at: Need to Find Ways To Make Extra Money For Christmas? 12 Easy Ways to Earn Amazon Gift Cards. With just a few hours a week, you can start earning gift cards to fund your holiday spending. You can use these on your holiday and Black Friday 2018 shopping. Swagbucks is like using Google to do your online searches, except you get rewarded “points called SB” for the things you do through their website. Then, when you have enough points, you can redeem them for cash, gift cards, and more. You’ll receive a free $5 bonus just for signing up today! Answer surveys. Survey companies I recommend include InboxDollars, American Consumer Opinion, Pinecone Research, Survey Junkie, and Harris Poll Online. They’re free to join and free to use! You get paid to answer surveys and to test products. It’s best to sign up for as many as you can, as that way you can receive the most surveys and make the most money. As you can see, there are TONS of things you can do to start making money for the holidays. Secret Santa is your friend. If part of your holiday celebration is gift giving with all of your family and friends, you may want to think about doing a gift exchange where everyone draw names and then only gives a gift to the person whose name they draw. This won’t just save you money, you’ll be able to put more thought into those gifts because you’ll have fewer things to buy. If you are going to do an exchange, make sure that you draw names before Black Friday 2018, so you know who everyone on your list will be. This is something that we do with my husband’s family. The younger children still get gifts from everyone, but all of the adults just do an exchange. It makes it much easier and more enjoyable! Start as early as you can. Even though Black Friday 2018 is about to kick off this year’s holiday shopping season, know that you can always start ahead of time. I know a lot of savvy shoppers who start shopping a year in advance– those are some amazing planning skills! You may call them crazy, but I’m sure it saves them a lot of stress and money. The earlier you start shopping, the more money you are likely to save. This is because you won’t be in a rush and end up buying something you didn’t need in the first place. It also means you’ll be able to shop the sales to find the best Black Friday deals. Related money-saving tip: I highly recommend signing up for a FREE 30 day Amazon Prime account, as this can really help you save money when it comes to holiday shopping. This free 30 day account gives you unlimited FREE two-day shipping, you can borrow Kindle books, watch movies and TV episodes, and more. Plus, Amazon is full of Black Friday deals. While this tip won’t necessarily work for this holiday season, you can start saving and preparing for Black Friday 2019! I would start by looking at what you’re spending in 2018, and use that as an approximate savings goal. You can then start setting aside a little bit of money each day, each week, or even each month. This can really take the sting out of the holiday spending season and prevent you from going into debt. Another way to prepare for next year is by taking part in a holiday savings challenge, such as the $20 Savings Challenge. This is a great way to easily save $1,040 this year without noticing! All you have to do is put aside $20 each week for a year, meaning you’ve saved $1,040. Remember the true meaning of the holidays. No matter what holiday you celebrate, remember the real reason for celebrating. Plan an outing rather than a gift, like seeing a movie together, going ice skating, etc. Make time to call or video chat with out of town friends and family. Time is often harder to give than anything else, and that’s because we only have so much of it. Your family and friends know this, and that’s why the holidays are such an important time of the year. How much money will you spend this holiday season? What are your Black Friday 2018 shopping plans? The post Black Friday 2018 Doesn’t Have To Be The Start Of Holiday Debt appeared first on Making Sense Of Cents. Previous articleWalmart vs. Whole Foods: Which Is Cheaper for Organic Food? Sparkly Holiday Nail Patterns just $6.99 shipped! All-New Echo Show only $179.99 shipped!